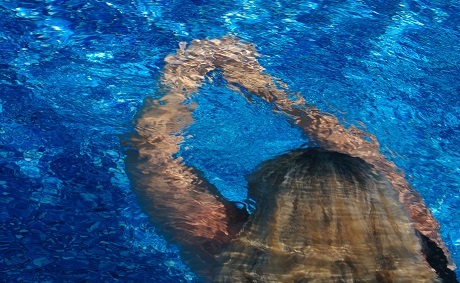 Whether you’re an active or recreational swimmer, you’re probably familiar with how chlorinated pools can wreak havoc on your hair, skin, and nails. For your hair in particular, chlorinated water can break down and dry out the cuticle─leaving you with a brittle, tangled mess! Unfortunately, chlorinated swimming pools are tough to avoid: While pool sanitizing technology has improved by leaps and bounds over the last few years, many public and private pools still use heavy chemical loads in their water. Outside of the controlled environment of your backyard pool (where safer, gentler methods like UV light and ozone can be used), you’re bound to encounter chlorine─and all of its nasty side effects. Looking to enjoy a dip in the pool while keeping you hair fresh, happy, and healthy? Stay low-stress and tame your tresses with these 5 Ways to Protect Your Hair from Harsh Pool Chlorine. 1. Wet down your hair. The first step in protecting your hair from chlorine is to wet it before getting in the water. Research shows that dousing your hair in regular tap water (from the shower or even a sink) before taking the plunge helps slow absorption of chlorine and other chemicals. While this pre-wetting approach might seem counter-intuitive, there’s a great reason why it works: Your hair is porous, like a sponge, and if it’s already hydrated, there’s less room for taking on additional water. While pre-wetting won’t completely insulate your hair from chlorinated pool water, it will help to minimize the damage. 2. Use a hair conditioner. Chlorine strips your hair of the natural oils that work as a safeguard, leaving your tresses vulnerable to chemicals, irritants, and the environment. Keep your hair from looking like hay by coating your strands in any type of lubricating conditioner before swimming. Silicone and cream-based products work best, or you can opt for a natural solution like castor or coconut oil. There are even some specialty products out there that work to defend your hair while you swim in chemically treated water. 3. Put your hair up. This next tip works bests after you wet and condition your hair: Tuck your hair up with bobby pins or fasten it with a tie. Doing so can further lock in conditioner and keep out unwanted chemicals and irritants. You can check out several online tutorials that demonstrate simple ways to keep your hair out of your face and safe from chlorine. Putting your hair up not only seals in moisture, it gives you more time to focus on enjoying your swim—while still looking chic! 4. Use a swim cap. Perhaps the oldest and best-known way to prevent brittle swimmer’s hair is a basic latex or silicone swim cap. Swim caps offer an extra barrier against chlorine and other chemicals, are easy to find and are affordable to purchase. An added benefit is how they can help streamline your swimming speed by reducing water resistance while you stroke. If you’re swimming outdoors, a cap can also protect your hair from the sun’s rays and from heat─two elements that will only intensify damage to your locks. 5. Purchase a specialty cleanser. When all else fails, go for some retroactive protection. The goal here is removing as much as possible of the chlorine clinging to your hair after a swim—and to do so before you rehydrate the cuticle. Because chlorine can chemically bond to hair, you’ll need more than regular shampoo and water to thoroughly rinse it out. Buy a specialty shampoo designed to eliminate chlorine residue, as well as the awful smell it leaves. These products also target copper deposits that can discolor your hair. Or, use a simple, natural solution like apple cider vinegar or a citrus lift to leave your hair squeaky clean and smelling great. Be sure to choose a quality conditioner, and do a cold-water rinse afterward, which helps re-seal the cuticle and locks in moisture for luscious locks. Fighting to preserve your hair from the ravages of pool chemicals can be exhausting, but there are more than a few measures that can help you stave off damage. If you primarily swim in your backyard pool, there’s a smart, cost-effective way to avoid chlorine exposure in the first place: Convert your existing pool to a safer, healthier sanitizing system! 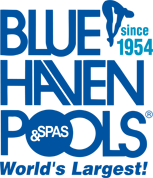 Learn more by visiting http://articles.bluehaven.com/3-ways-to-sanitize-your-pool-without-the-typical-chlorine-risks.